since, well, August of 2006. I know it's not even Friday yet in the States, but I'm awake and on the computer at 4:30 am. Yes, just a few minutes ago one of our lovely neighbors was down on the street, yelling at his taxi driver in Arabic for about five minutes straight. Needless to say, it was loud enough to wake me up. One of the cats too. Don't worry, the cat has since gone back to sleep. But not me, I'm awake enough to ponder Dubai for Independence Day. I bet nobody even notices. I read somewhere there are only something like 25,000 or 26,000 Americans in this city. That's hardly a blip! 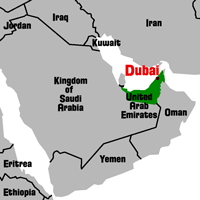 I bet there are more people from one city in India than there are Americans in Dubai. Last year for Fourth of July, you might remember, we were on our way back to the States, but stopped in Paris for a few days. Yes, one year ago today we were at the Eiffel Tower, Arc de Triomphe, Champs-Élysées and Musée d'Orsay. But where will we be next Fourth of July? Maybe I can go back to bed and dream about that. Good night, and Happy Fourth of July! Happy 4th of july I guess? I still have to build a float for tomorrows parade!